An 8TB flash card from SanDisk's new InfiniFlash platform. The IF100 holds up to 64 of the cards for a total capacity of 512TB. SanDisk is hoping the $1/GB price of its new InfiniFlash storage platform will be enough to convince customers that all-flash systems can be viable for big-data applications, including content streaming and giant databases. The first InfiniFlash product, the rack-mountable IF100, will sell for less than $1 per gigabyte, with the exact cost depending on who's buying, and how many, said Ravi Swaminathan, SanDisk's general manager of systems and software solutions. Pretty much everything about the IF100 is hot-swappable, whether it's the dual power supplies, the four fans, or the row of up to 64 flash storage cards each holding 8 terabytes. That gives the 3U (133 millimeter-high) box a capacity of up to 512TB. 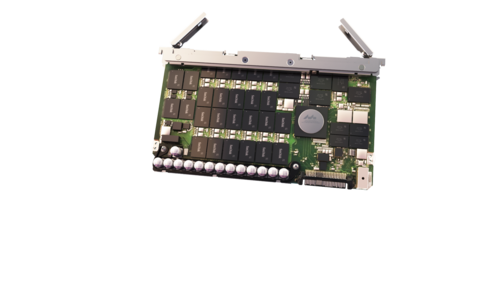 It can sustain a throughput of up to 7GB/s or over 780,000 IOPS (input/output operations per second) yet consumes under 750W fully loaded, replacing a hard disk array of thousands and thousands of watts. For all that, "This is just a box of flash. It has no compute in the box," he said. Instead, the IF100 has ports for connecting to up to eight external servers. In addition to the bare-bones IF100, SanDisk will sell two software-hardware bundles. The IF500 is a scale-out block and object store suitable for applications requiring over 2 petabytes of object storage, including content streaming or video surveillance, Swaminathan said. It includes an IF100 and InfiniFlash OS ceph, an enhanced version of the Ceph open source storage platform. The IF700, an IF100 with InfiniFlash OS ION software, is for high-performance block-based apps. Unlike the IF500, it leaves data protection to the application layer. Both the software-hardware bundles will sell for under $2 per gigabyte, Swaminathan said, with prices based on the raw flash capacity. Deduplication or compression software will bring the cost per gigabyte down, although the additional processing will have an effect on performance. Swaminathan is confident others will find it hard to match SanDisk's prices. "We are uniquely vertically integrated," he said, referring to the company's control of everything from the fab, or semiconductor fabrication plant, to the storage management software. "If you don't have a fab, you are going to be limited in your ability to meet this cost structure. And if you have a fab -- there are only four others that do -- you still have to have the enterprise focus," he said.